Like many, I enjoy feeding the neighborhood birds via a bird feeder or two, but watching the various picky birds sort through seeds, flinging the ones they don't like out onto the ground below creating a massive mess of wasted seed is quite annoying. 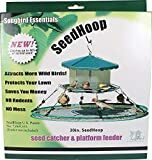 The solution is this cool new Seed Hoop - Bird Feeder Seed Catcher from Songbird Essentials. This handy mesh screen hangs below a bird feeder to effectively catch up to 90% of spilled and tossed bird seed before it hits the ground and doubles as an extra feeding platform for ground feeding birds or those waiting to use the feeder. Best of all, there's much less chance of spilt bird seed that either grows or rots and damages the grass and it helps eliminate an easy food source for hungry rats, mice, and other unwanted vermin. 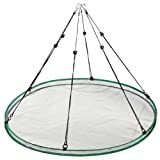 It features a wind guard to protect fallen seed, adapts to virtually any feeder, and is constructed from lightweight but durable vinyl coated fiberglass mesh. Available in either 16, 24, or 30 inch sizes.